Wow – what a read. This book made me laugh and cry. It’s packed with gentle drama and some really deep emotions. I hadn’t got far in ( 11%) when the first big laugh hit me, took me by surprise and made Him Indoors ask me what I’d found so funny. It’s one of those things you have to read in context though, and wasn’t so funny in the retelling. It’s the toilet scene by the way…I think it struck a chord as its just the kind of thing that would happen to me…. Anyway, Harry. What a man, kind, full of fun, goodlooking and Suzie is in love with him. Trouble is they’ve been best friends and work partners in their wedding proposal business for two years now. Harry has been there for her through everything, at her side helping whenever and wherever she needs it. She can’t tell him she loves him though, he always has a string of ladies on the go, so clearly her feelings aren’t reciprocated, she doesn’t need the embarrassment it would bring, and she doesn’t want to lose her best friend. 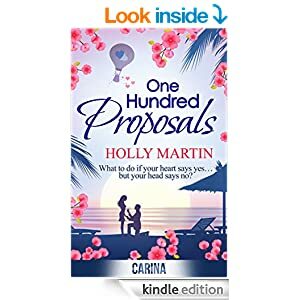 Now he’s got the backing for his latest idea – and its her dream if only it were real, how will she cope with the heartbreak of being asked daily for 100 days the one thing she’d love but isn’t going to get. Oh poor, poor Suzie, what a nightmare, but there’s no way out. I so felt for her, and then when we get parts of the story from Harry’s POV I felt for him too. Great characters, fabulous humour and some wonderful, imaginative ideas for proposals – it’s a great read. Made me laugh – and at parts it made me cry. I thought I’d got Chloe worked out but was wrong about her, and just kept wanting to scream at both Suzie and Harry – “ just tell him/her!! !” Of course if either did that would certainly shorten the book and spoil the story 🙂 but its so well written that you just want things to work out for them. Stars: Five, its a real fun read though I’m not sure if I’d re read, but for a one off, feel good romance full of passion and drama its perfect. ARC supplied via Netgalley and publisher.